Who has gotten into the habit of choking down your food? saying, "let's eat in living room and watch some Netflix"
"I'll eat later... y'all go ahead." I know full well how fast paced this life is for everyone. But I also know full well that we will NEVER get this time back. 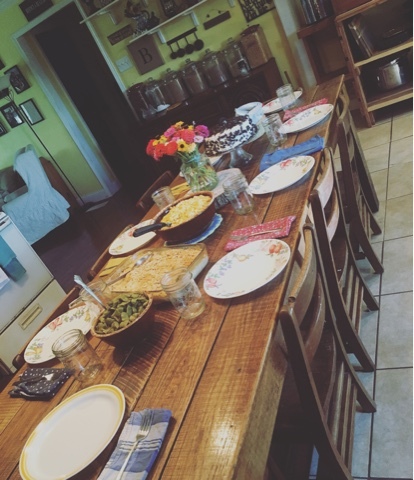 Meals around the table should be a time of enjoyment, a time of talking, relating, savoring, sharing. That's how they have always been, or should have always been, it's just that we have gotten out of the habit. Convenience, ease, and conflicting schedules make it difficult to make that time anymore. TAKE BACK THE FAMILY TABLE! Did you have something that was really hard? Encourage one another after listening. Go out and pick some wildflowers. Set out real plates... or even plastic if your rushed for time. But sit AROUND your table. Even if you can only do it one night a week because of schedules... Do it. Make it a priority. Remember the need for families to stay families. So much is out there to pull family in different directions. Use the table to pull back together. Maybe there is NO way you can do this for supper... but you might could pull together a breakfast. Learn about them, talk to them, share with them and get to know one another in a way that you can't any other time. And then, get to know others that way too. Sharing a meal with others is such a sweet, simple way to get to know people. The food isn't nearly important as the atmosphere in my opinion. Make your place hospitable. Make it a place that is easy for others to feel at home while they are there. Make it a part of your children's memories that they will want to continue in their own family. Take Back the Family Table. Love this, Chas. SO true and such a great reminder that this time we have together is fleeting.